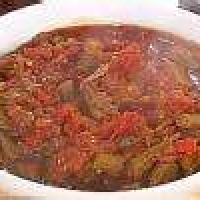 Take a quarter peck of okras, slice them round, and put them on the fire, with a slice of ham, and a gallon of water; boil the whole about five hours. Half an hour before serving the soup, add quarter of a peck of tomatoes, skinned. How do you handle the "slime" that occurs when okra is cooked? What can be done to get rid of the "slime"?